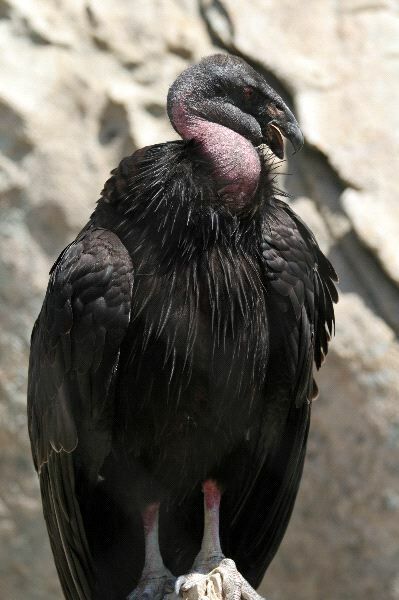 The California Condor belongs to the Vulture family of birds. They are considered to be the largest land bird in North America. It can weigh up to 29 pounds with the females usually being several pounds lighter than the males. For many Indian cultures this bird is a symbol that is very important to them. It is part of various rituals that they still take part in today. The California Condor is a very large bird with black feathers. The body is thick and they have a small head that is tan in color. They are bald and there can be areas of yellow or red on areas of the head. The colors are believed to change depending on the mood of the bird. Underneath the wings they feature a patch of white. Their wing span can be up to 11 feet long, their weight range from 15 to 22 pounds. They have very sharp talons with a middle toe that is longer than the rest. They use this part of the body for protection as well as to get food. The Grand Canyon region is where the California Condor lives in the largest numbers. They are also found in Zion National Park, the mountains of Western California, and Baja California. Most of them though still live in captivity due to the drastically low numbers. In the wild they tend to live close to cliffs and to tall trees. They can have a home range of up to 150 miles that they will cover to find a place for nesting and to find food. They are very fast in flight and also very graceful in those movements. They have some vocalizations including hissing and grunting. Those sounds are typically reserved for warning off other birds and for calling to find a mate. 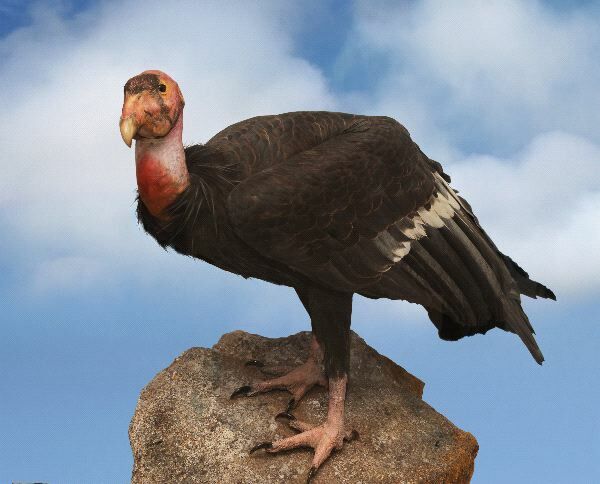 The California Condor is a scavenger and they will eat food remains that other animals have left behind. They feed on anything ranging from rodents to rabbits to the remains of big cats and deer. They are also well known or circling from above when there are signs that something is going to die very soon. They know their survival depends on finding food so they will even try to force other feeders from a given area so that there is more for them to survive on. The California Condor is ready to mate around the age of 6. The males will call out to females and they will also dance around with various feathers displayed so that they look larger than they normally would. The female gets to decide if she will accept the advance or not. If she does, the pair will become mates for life. The pair will create a nest high in the trees to keep it safe from predators. One egg will be placed into the nest between February and March. It takes from 53 to 60 days for the young to come out of the egg. They can fly on their own around 6 months of age. However, they will stay with the parents for up to 2 years. When an egg is lost it is possible for the pair to create another to replace it. Due to the low numbers of the California Condor this is often manipulated in captivity. The first egg is removed from the nest and the young are raised by humans until they can care for themselves. The bird pair will create a second egg that they are allowed to care for. In the wild the California Condor has been known to live for up to 45 years. At this time the California Condor is considered Critically Endangered. The numbers of them have become drastically low due to poaching, poisons, and the loss of their natural habitat. In 1987 there were only 22 of them known left in the wild and they were placed into captivity. As a result of careful breeding programs there are now 384 of them in the world. 181 of them are living in the wild but continue to be protected by the government.